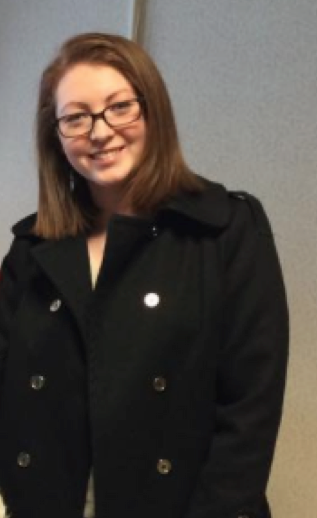 Today’s blog is from Katie Knight, an undergraduate student at Carson-Newman University in Jefferson City, Tennessee. She works with the New Horizons team to help map some of the unusual terrain on Pluto, seeking patterns and estimating sizes and shapes of some of its unusual features. Hello! My name is Katie Knight, and I’m here to talk about Pluto’s unusual geological features known as polygonal blocks. 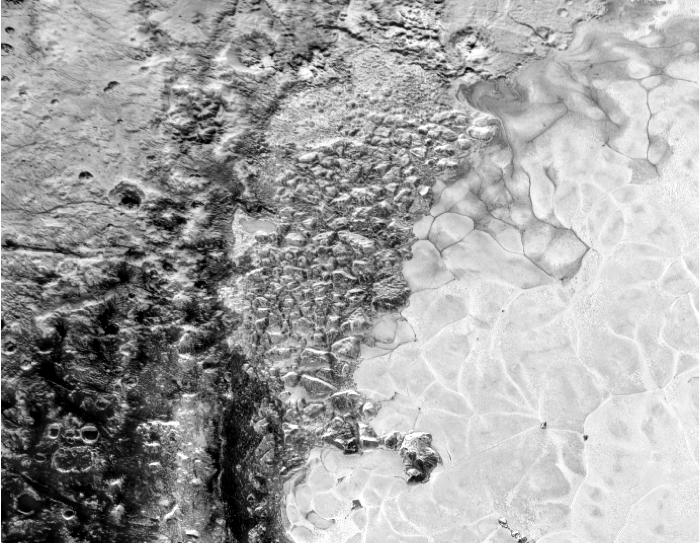 If you look to the upper left of Pluto’s “heart,” informally-named Sputnik Planum, you will see some chaotic terrain that is very different than the almost smooth terrain of the icy plains. These are the Al-Idrisi Montes, and they are filled with blocks measuring miles to tens of miles across. The blocks within even a very small region can be very different. Some are really distinct and appear to be taller – without any other blocks touching them – while others get a bit more complicated. It’s my job to try to separate out which is which. For example, I analyze them to try to see if these blocks might actually be one big block with some variation in height or if they are separate blocks themselves. The high resolution photos New Horizons took detail the surface with amazing clarity, but they can only show so much. To look at the size and shape of the blocks, I trace them. The goal is to trace around the base of the blocks, including all the visible sides. Since the blocks cast shadows, some sides are very difficult to see. I am looking to see if there is an area range that is most common or potentially if there is a common shape. It can get complicated, since some blocks seem to blend together. The shadows that the sun casts on the blocks further complicates this analysis, but a lot can be distinguished. The blocks significantly vary in size and shape, but there may be some similarities between them that can be determined. After this first look at size and shape, there are a lot of things we can also analyze. Topography can tell us about the height of blocks and indicate if they not only have some similar area but also a similar height. I am using gray-scale images from New Horizons to analyze the basics of the blocks, though the color pictures can tell us even more about the surface, so later I will analyze those too. Learning the basics of these blocks will contribute to our knowledge about how the ice blocks formed. There are several theories and studying blocks on another planet will tell us even more. Chaos terrains like these on Pluto, while very different, can be compared to chaos on Mars and Europa to see what is common between all three of these and what that can tell us about the surface of all of these bodies. 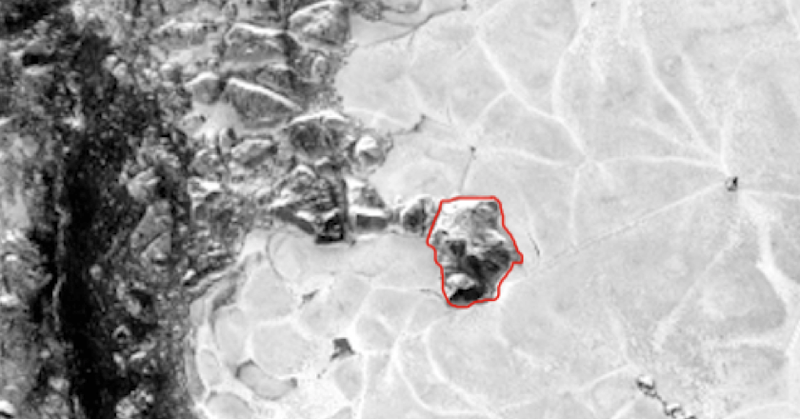 The area I am looking at may be relatively small, but there is a lot we can learn from these blocks and I can’t wait to see more of what Pluto has to offer! 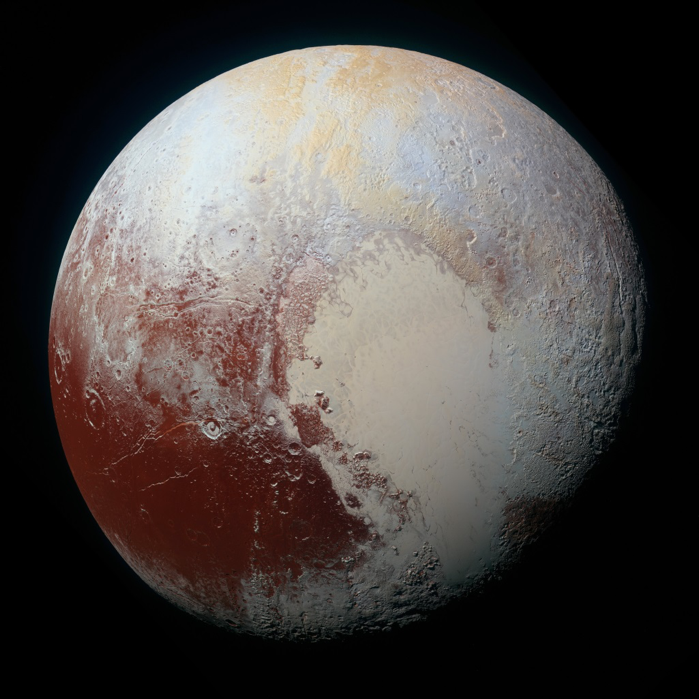 Next Next post: Pluto’s ‘Snakeskin’ Terrain: Cradle of the Solar System?